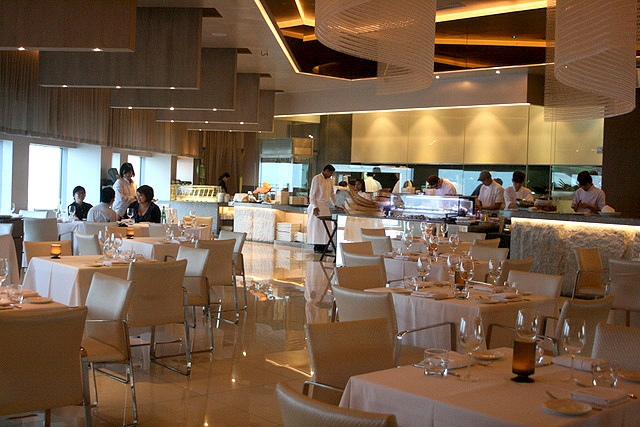 Stellar at 1-Altitude reigns as one of the 'highest' restaurants in Singapore. 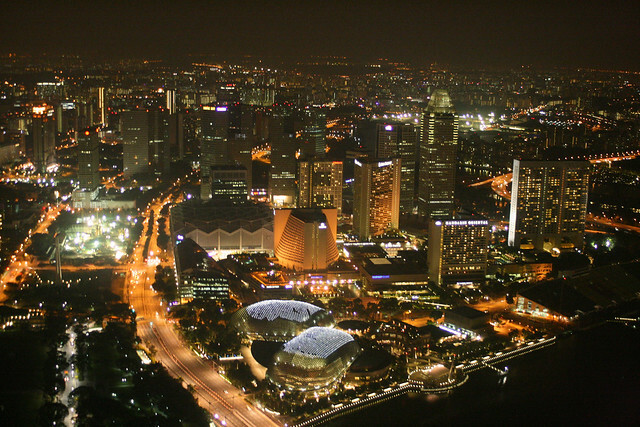 At level 62 or 275m above sea levels, it certainly conjures up an image of being very "atas" (Malay for "up", slang for upmarket). But surprisingly, it's a lot more casual than I expected. I immediately liked the white decor and high ceiling - it's got an air of summery chic, and beckons you to relax. It might even cure you of acrophobia. 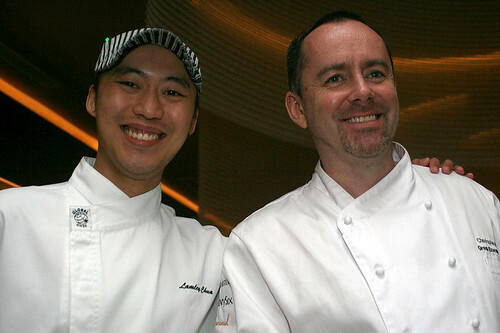 Group Executive Chef Christopher Millar has also crafted a menu that's fine-dining, but not too intimidating. There's charcuterie, sushi and sashimi, an oyster bar, wood-fired grill and rotisserie, plus patisserie selections from 1-Caramel. It's a modern mix, but not fusion. I spied this leggy beauty from afar, the moment I stepped in. 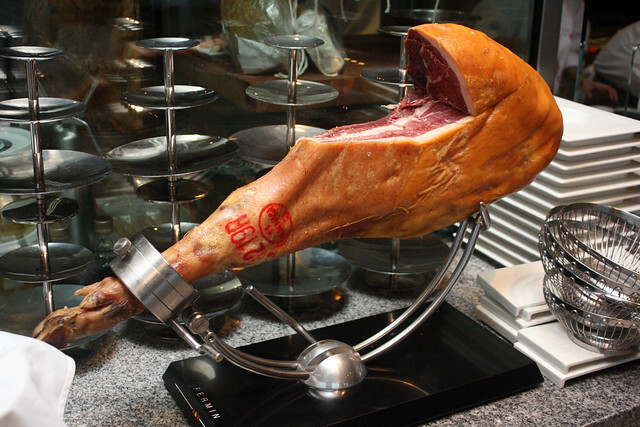 Hello jamon! Ah, things were looking good right off the bat. 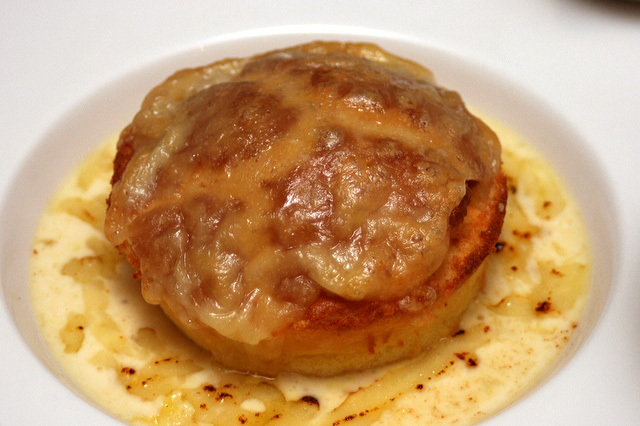 We started with an indulgent appetiser of twice-baked Gruyère soufflé (S$20). Beneath the mozzarella crust is an incredibly light, moist and flavourful cheese soufflé. Drizzle on the accompanying cheese sauces (especially the blue cheese). Never say no to more cheese. But if cheese is not your thing, you can go for the seared Hokkaido scallop and octopus (S$24), which is as pretty as a garden. 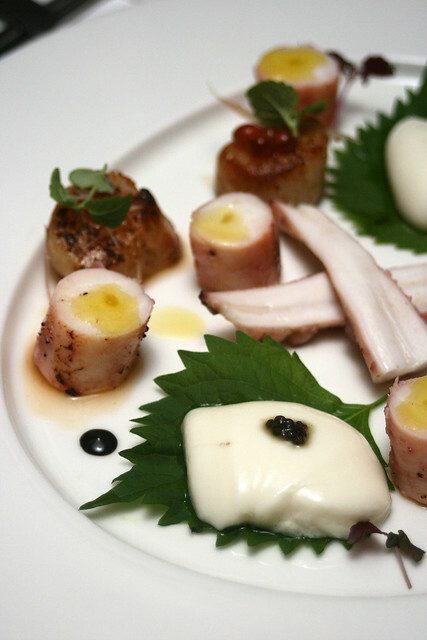 The octopus has been done sous vide style for that unusual tenderness. But the nice surprise here is the steamed ginger custard (that cream pudding-like thing on the shiso leaf) topped with just enough Sevruga caviar. It's beautifully smooth and comforting at the same time. 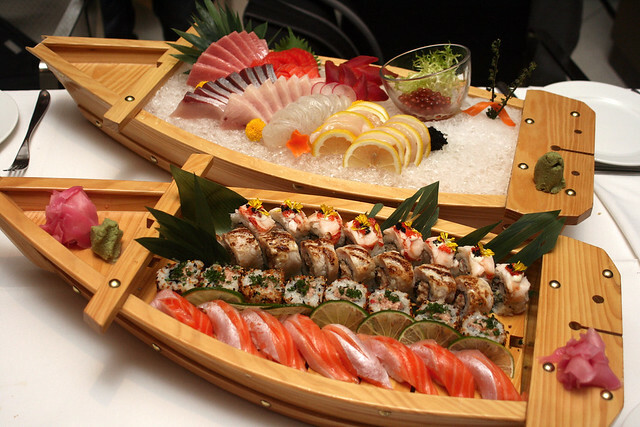 But what is truly stellar here are the sushi and sashimi. Here are two boatloads of breathtaking pleasure. 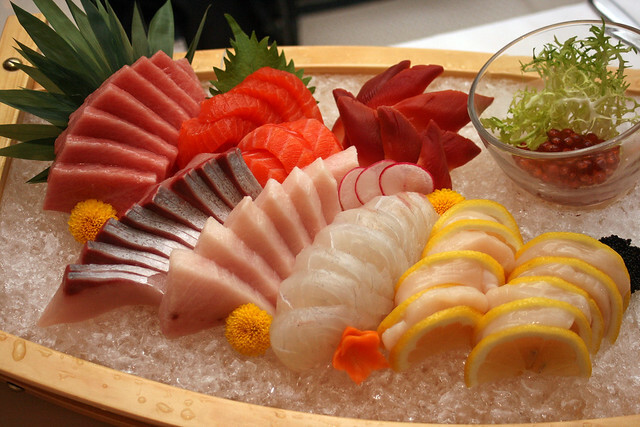 Sashimi: Omakase Taster (S$55 per person). Very fresh and beautifully firm. 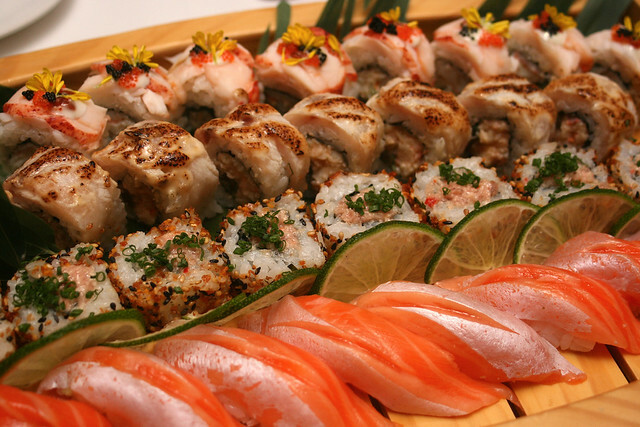 And salmon belly nigiri to round things off. Kudos indeed to the sushi chef (left), as well as Chef Millar (right) who took the time and trouble to explain each course to us. I detect a dash of the quirky and offbeat too, underneath the professional veneer. 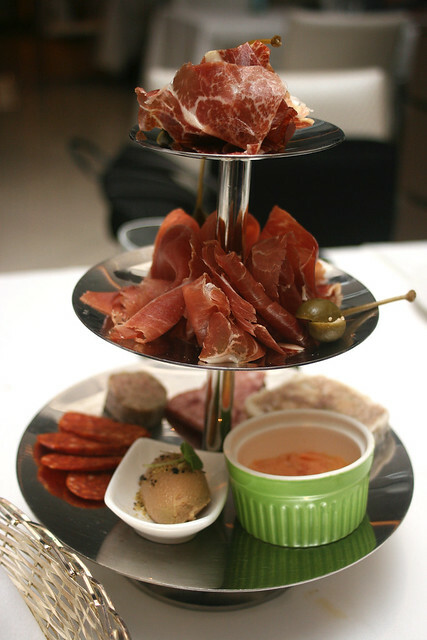 The Charcuterie taster (S$48) would be my kind of three-tier afternoon tea. Forget cakes and scones. Jamon (Iberico and Serrano), saucisson, parma ham, terrines, mousses, a salmon rillette and a lovely foie gras parfait - infinitely better. All nicely served with homemade pickles, quince compote and rustic bread. The jamon did taste a wee bit more gamey than I've had elsewhere, but it's still a little slice of heaven. 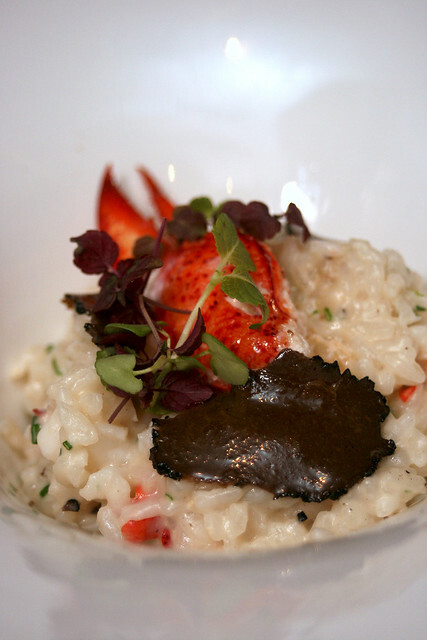 Truffled risotto with poached Maine lobster (S$48). The very strong truffle aromas overwhelmed this dish. There's an entire lobster claw as well as chunks of lobster in here, but overall, the portion is still smallish. Then again, maybe that's just right for risotto, which can fill you up all too quickly. 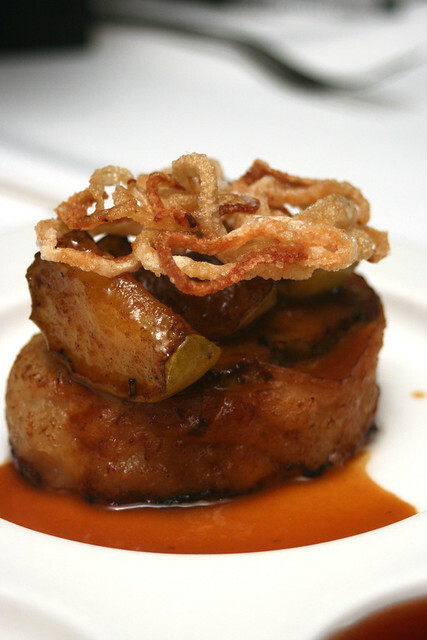 Slow roasted suckling pig with Iberico jamon and fig stuffing (S$48), which also comes with cubed Kurobuta pork belly, fried apples, apple & pear jelly and crackles. I think I was too full by now to really appreciate this. Yeah, I'm guilty of polishing off the cheese souffle and lots of their rustic bread (but no regrets). 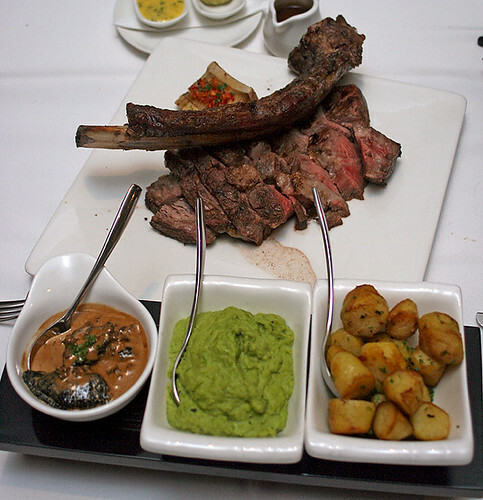 But there was still this 800g 'Tomahawk' rib eye (S$140) that challenged us to finish it. It's a war-cry not to trifled with, but we hear there are patrons who have conquered this dish alone. To me, it was just too much brute quantity, and I was glad to have others sharing this with me. I actually found the sides more interesting - portobello with morel cream, smashed peas and mint, and truffled kipfler potatoes. 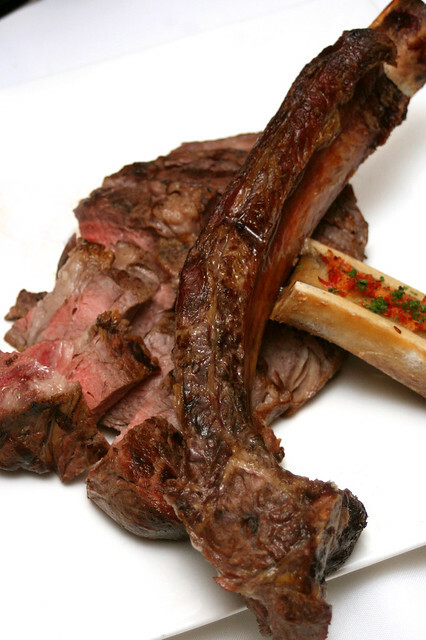 Oh, and there's some bone marrow too. Finally, we reached desserts. Here are some of the signature items, all S$16 each, made by 1-Caramel (previously at Handy Road but now moved to 1 Rochester Park). Chocolate Seduction - probably the best of them all. 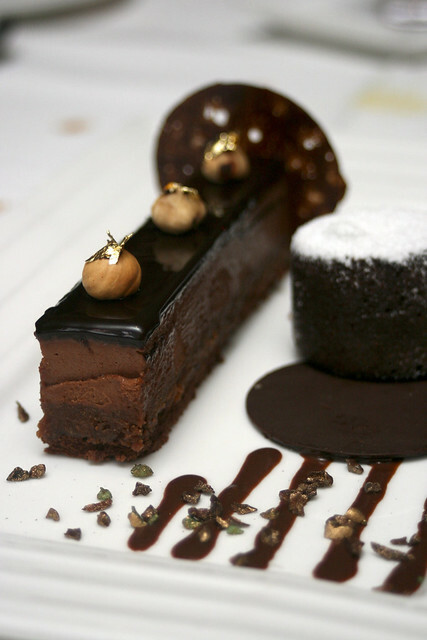 Layers of hazelnut chocolate mousse and praline feulletine, Valrhona orange sauce and warm chocolate almond lava cake. It's really quite simple. Hazelnut + chocolate = win. 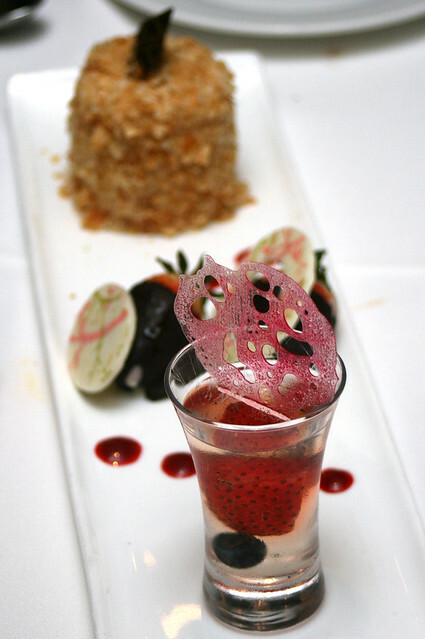 Trio Fraise is for strawberry lovers. Berries in champagne jelly, chocolate dipped strawberries, and this cake made from layers of fresh strawberries, vanilla genoise and strawberry mousseline coated with golden brown puff pastry (background). Tropical vodka trifle. 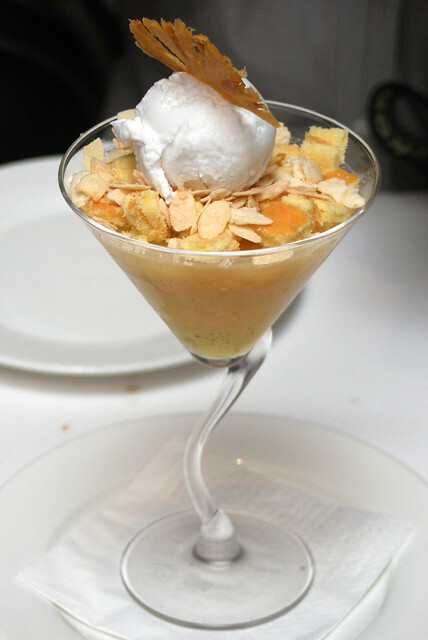 Pineapple gazpacho jelly with pineapple sponge cubes with crystallized baked almonds topped with coconut sorbet. Tastes like...a Pina Colada. 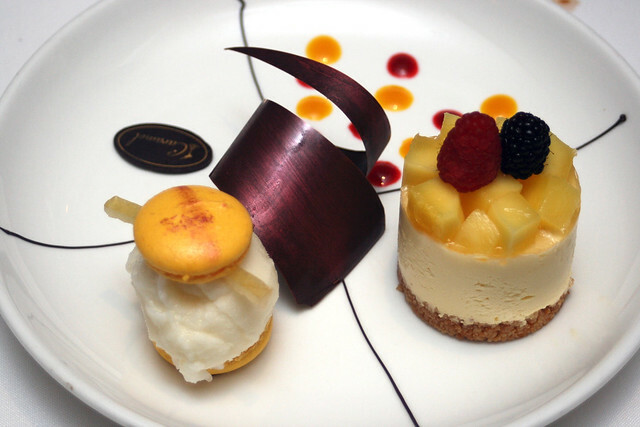 Tropical Teaser (S$16) - mascarpone on coconut crumble, topped with mango and berries. Paired with lemon sorbet between macarons. The mango was too tart, so this became a dessert with too many sour elements. 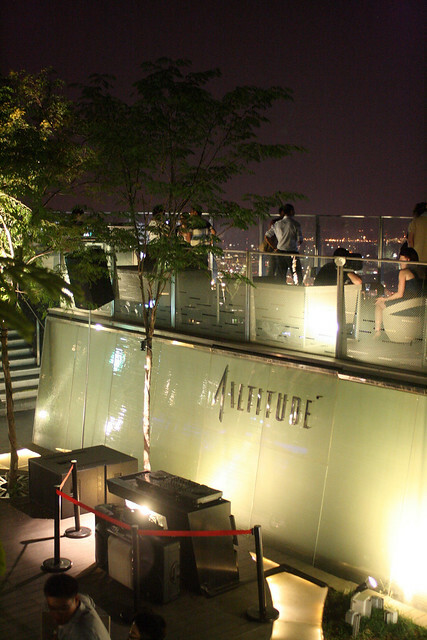 will be entitled to 50% off all housepour drinks at 1-Altitude Gallery & Bar. The views from the world's highest al fresco bar are phenomenal. You have 360-degree panoramas from your vantage point all the way up on the 63rd floor. 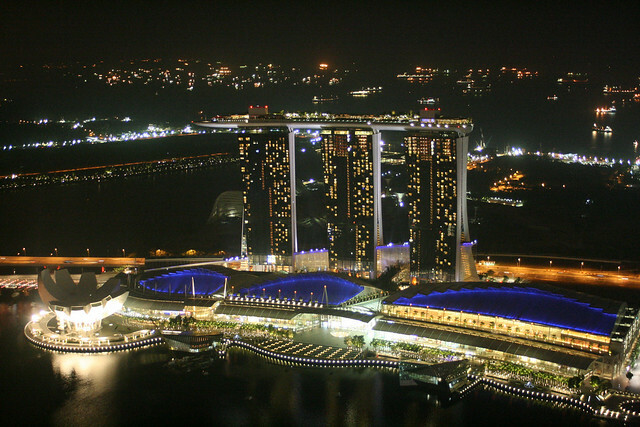 Even the Marina Bay Sands looks tiny! It's a great way to end the evening. Man, I was kicking myself for not bringing along a tripod for night photography. But I guess that's another good reason to come back. Dress code: Smart casual. No shorts or bermudas, flip-flops or slippers. Thanks to Lily Hamid and Chiew Yen from the 1 Rochester Group for inviting and hosting us. haha the bread was good, nice meeting you and beautiful photographs! Oh I love Gruyère soufflés - the last one I had made me melt like the cheese it uses, hehe. The restaurant looks amazing and the food, too but I think what is quite the catch here is the view! I can only dream how beautiful it is! !